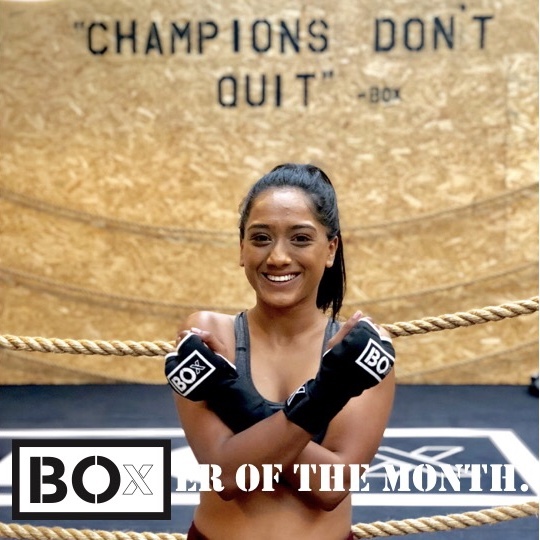 Our BOxER of the month in September was Sejal Patel. Sejal’s positivity is evident, she’s friendly and encouraging with everyone at BOx and has been an amazing supporter of ours since she walked through the door. We get a real buzz from anyone who shows willing and gives maximum effort in class, Sejal does just that every time and proves that comfort zone’s are there to be pushed. From a non gym-lover, to a fully converted BOxFAN; we are proud to have her join us every week for a sweat fuelled workout. Watching Sejal become more confident in boxing, fitness and her own skin from just a small lifestyle change, is what we do this for. Well done girl, keep smashing it, keep showing those insta followers how it’s done. Annie, Bo and the rest of the team make you feel so welcomed. The skills they have and share are invaluable. They ensure they know all their members and push you to the best of your ability! I’m still not great and have a long way to go but my fitness level has improved vastly and I’m super proud of how far I’ve come, it’s brought out a whole new me! More importantly I’m constantly improving on the best type of me.